﻿It is a glorious crossover of digital technology and live performance, that is allowing National Theatre productions to be broadcast into remote cinemas. Whilst the projector can never recreate the intimacy and physicality of the shared experience of sitting in a theatre, when a production is either sold out, or impossible to get to, then NTLive is the next best thing. So it is with Frankenstein, a production that has by now garnered many deserved awards. 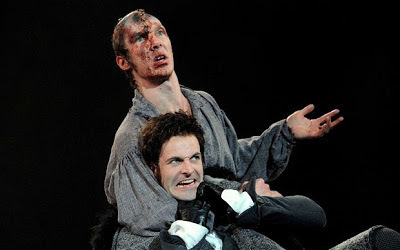 As has been widely reported, Jonny Lee Miller and Benedict Cumberbatch played the roles of the Creature and Victor Frankenstein, alternating the parts between them throughout the run. I was fortunate enough to see the staged production in the Olivier Theatre last year, with Cumberbatch as the Creature. More recently I saw the NTLive broadcast, recorded last year, with the roles reversed. Both Boyle and Dear had encouraged audiences if possible to see both casts , a luxurious ambition in itself as just getting hold of a ticket to one of the performances last year was nigh on impossible. The Best Actor awards that the production has won have been rightly shared by both men. Whilst the role of Victor required acting perhaps of a more traditional style, the delivery of the Creature demanded the actor to convince the audience that he was truly an animal learning the most basic bodily movements, with guttural speech abilities that evolved over the show's two hour length. It is a testimony to writer, director, and above all both performers, that this learning process and development was presented on stage with no trickery or special effect but rather simply by acting , movement and facial and vocal expression of the highest standard. That the Creature is also able to share his emotional and intellectual development with the audience is further evidence of the tour de force that the performances were. ﻿ Having seen both castings, it is possible to compare - and my preference erred towards Lee Miller as the Creature with Cumberbatch as his creator. Cumberbatch provides a deliciously patrician performance, which added to the crazed creative arrogance of the scientist. I found myself moved to hate the wickedness of his Victor Frankenstein more, which in turn suggests that Lee Miller perhaps evoked stronger empathy as the Creature. A hideous monster, borne trusting into a hateful and suspicious world as an innocent and who discovers first desire and subsequently betrayal . Naomie Harris was a delight as Elizabeth, Victor’s fiancée. She showed honesty, love and compassion to both Victor and the Creature and earned the audience’s sympathy convincingly. Also noteworthy was Karl Johnson, as the blind and hence non-judgmental Delacey, who teaches the Creature to read and to reason. The supporting cast was predominantly excellent. In two minor roles , Ella Smith provided a very effective setting of the scene. First as a buxom prostitute, horrified by the Creature, and later as Clarice, re-assuring maid to Elizabeth nervous on her wedding night, Smith added a touch of horrific authenticity, redolent of Hammer horror films, suggesting with her warm naiveté, that terror was never far away. The NTLive broadcast camerawork was skilful and well directed. We had sat in Row A of the circle last year, but even there, had not been able to observe the meticulous detail put into the Creature's stitches and make-up. 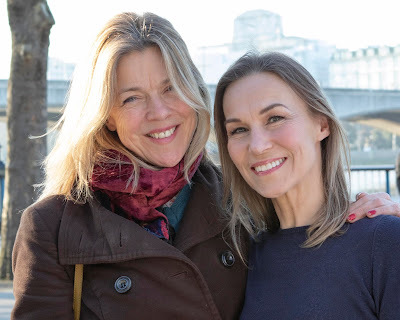 That the horrific scarring of the Creature’s body stood up to the HD scrutiny of a large screen digital projection, is further testimony to the brilliance of the National Theatre’s creative team. Lighting and design were excellent, and the music by Underworld set the tone perfectly. The National Theatre have a theatrical masterpiece with this production. See it if you can.